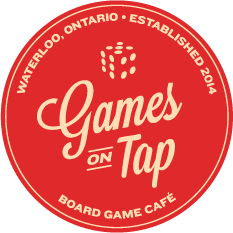 Board games have definitely hit the mainstream and our little corner of Ontario is seeing it as well (must be since I moved here....) Two board game spots are opening and my co-blogger Daryl and good friend Ray are both going to be serving at one of them: Games on Tap in Waterloo. Family and friend previews start this weekend and I may try to sneak in and take some pictures. Best part? The place is licensed. AWE-SOME! Check out their Facebook page here and the local news story here with info about both locations, the other being The Adventurers' Guild down in Kitchener. Great way of enjoyment. It will be helpful for the users to enjoy life in a fantastic way. wow, licensed cafe looks more attractive. Here you can feel yourself confident and use all your tips. I have special one here https://casinority.com/the-7-gamblers-habits-for-the-big-win/ Good luck, guys! I would like to visit all famous casinos, and not https://www.nativecasinos.com/online-casino/live-dealer just play online.